The first new historical recipe of 2018 concerns small chicken pies from nineteenth-century French cook Carême. The stuffing is seasoned with one spoonful of sauce espagnole. That will be easy, I thought, just look up what Carême has to say about this sauce and prepare it. But things were slightly more complicated. 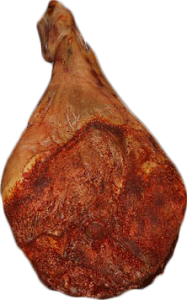 I will not tell the complete history of the sauce espagnole and all its mutations on this page. I will save that for another publication. However, based on what I have read up until now, I think that the sauce espagnole as a mother sauce originates from the eighteenth century. Several sources on internet place its origin in the seventh century. Moreover, I have not found any recipe at all that uses tomatoes or tomato purée in the preparation of sauce espagnole in French cookbooks before Escoffier. According to Carême the colour of the sauce should be a reddish brown, but in his recipe that is due to the extreme reduction of the meat stock and not by adding tomatoes. I am not done looking for recipes for espagnole, so maybe the tomatoes will turn up in the sauce before 1900. 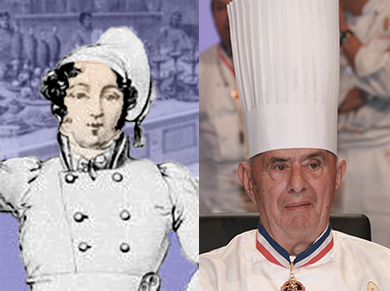 About the picture on top of this page: Carême modernized the cook’s costume, and one of his improvements was adding a stiff board to the top of the chef’s hat so that it would not look like a sleeping cap anymore. Although … there is still a tassel hanging from it. In the Maître d’hotel françois (1822) Carême published a drawing comparing the looks of the old and modern chef’s uniform. I have adapted part of that drawing for the illustration on this page. Apparently, (male) chefs felt the need to show who has the tallest hat. Bocuse won. What started as a real improvement, deteriorated into a hazard when manoeuvering doorposts, or bending over the furnace or getting something out of a low cupboard. Maybe I am too Dutch. Carême already describes the sauce espagnole in his first cookbook, the Pâtissier Royal Parisien from 1815. The sauce is not actually part of the preparations of pastry bakers, but they should at least know how their pies were served. In his life work, the Art culinaire française au XIXe siècle the sauce espagnole and the other three mother sauces are also presented. Later a fifth sauce would be added. This is a short version of Carême’s recipe for sauce espagnole. Cover veal, partridges (later this changes to pheasants) or young rabbits and a jambon de Bayonne (French cured ham) with meat stock. In a footnote Carême remarks that the stock must be made without adding salt; that will only be added in the finished sauce or soup. Bring everything to the boil, and simmer until the liquids are reduced with 50%. Temper the heat and reduce even more until you have a glace. Take the glace from the fire when it has turned deep red and slightly gelatinous. Meanwhile, prepare a brown roux from butter and flour. Now I am not certain if I understand it well, but it seems that the sauce must be prepared by adding new (unsalted, slightly concentrated) stock to the brown roux (“Vous emplissez alors la casserole de consommé ou de bouillon”), which is then added to the pan with the meat and the glace. Simmer the sauce for several hours with parsley, chives, basil, thyme, bayleaf, cloves and cuttings from mushrooms. Degrease after one hour, and again after 90 minutes. The strain the sauce and keep it in a pot for further use. Remember, this is just a basic sauce! Carême also provides a more simple recipe for sauce espagnole, that can be prepared in smaller households by the cook (la cuisinière). This is made with veal, chicken and ham, fried in butter, Then chopped onion, carrot and mushrooms are added, with thyme, bay leaf and nutmeg. When this has turned brown, flour and stock are added. Strain the sauce through a sieve, press a little. To make espagnole, finish with some gravy or jus de veau. Other recipes from Carême on Coquinaria: Barley soup à la française, Russian chicken pies, Strawberry soufflé, Stuffed oranges, Soufflé with mint. I chose another version for sauce espagnole, from Paul Bocuse, idol of the ‘nouvelle cuisine’ in my youth. 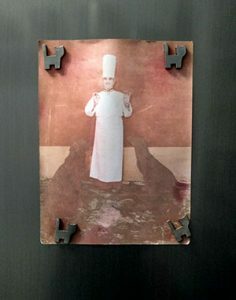 On my refrigerator hangs a faded picture that I scanned from a Dutch newspaper (de Volkskrant or the NRC) with a portrait of Bocuse in full chef’s costume, being adored by his two dogs. The picture probably dates from the early nineties of the last century (maybe earlier), and I do not know who the photographer is. The recipe below is a century and a half more recent than Carême’s version. It still requires some work, but the end result is a very flavourful sauce with a taste that we now call ‘umami’. EDIT – On the day I published the English version of the recipe, it became public that Paul Bocuse has died at the age of 91. The recipe is from La cuisine du marché from 1976 by Paul Bocuse. (see bibliography for French and English editions). A medium carrot ; a medium onion ; 50 gram fresh lard (pork belly), everything chopped ; a sprig of thyme, a piece of bayleaf ; ½ water glass dry white wine ; 150 gram cooked bnrown roux ; 2 liter jus [de veau] or concentrated veal stock, or else lightly salted dark meat stock. Melt the lard in the pan in which the sauce espagnole will be prepared, add the flavourings and fry on low heat until browned. 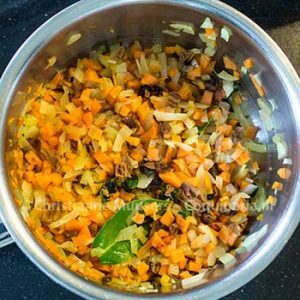 The mixture of chopped vegetables is called mirepoix. Remove the lard [from the pan], add the roux and the jus de veau or veal stock according to the method as described at the recipe for roux, then add the white wine. Cook [the sauce] very softly for 2 hours, scooping off any impurities and fat that floats on top (this is called skimming). If the roux has not been prepared in advance, it is prepared directly in the pan for the sauce, and the mirepoix is prepared in a small pan and added when it is ready. The remaining baking fat must then be dissolved with the white wine. Now strain the sauce espagnole through a cloth or fine-meshed sieve. Put it back on the stove with a water glass of concentrated tomato purée. Cook for another hour, skim often. 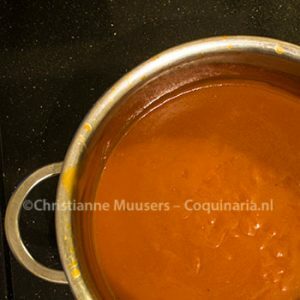 If the sauce espagnole is destined to be used later, pour it through a strainer into a glazed pot and stir very often with a woorden spoon (‘vanner’) until it is completely cold; in this manner one prevents the forming of a thick skin with lumps [in the sauce] as a result. Although I used Bocuse’s recipe, I did change some things. I have added clove and mushrooms because of their presence in older versions of sauce espagnole. And I leave the lard in the sauce, because any excess fat will be skimmed anyway. For an even more historical version, leave out the tomato purée. Use red wine instead of white for the colour of the sauce. This recipe is for 8 to 10 decilitres sauce espagnole. The sauce can be kept a few days in the refrigerator in a well closed container. Carême indicates that this sauce is prepared in larger quantities to have in stock for a quick preparation of the lesser sauces.. 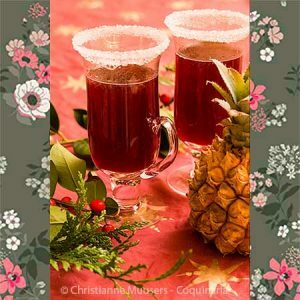 Yields about 8 decilitres; preparation in advance 30 minutes; preparation 3 hours. Make a brown roux with butter and flour. How to this, can be read here (until point 5), but leave the roux on the stobve a little longer until it has turned a nice, nut-brown colour. While the roux is being cooked, steep the dried cèpes in about a half cup of jus de veau wich has been brought to the boil. Then strain the liquid through some kitchen paper or a cofee filter and return it to the rest of the fond. Chop the mushrooms into small pieces. Melt the chopped lard, add vegetables, mushrooms and herbs (mirepoix). Fry until the vegetables turn brown. Scoop everything out of the pan and pour the wine in it. Stirto mix with the fat, and reduce the liquid to about 3 tablespoons. Add the mirepoix with the reduced wine to the roux, stir well, and start adding the jus de veau (follow the instructions). The sauce will remain rather thin because of the amount of liquid that is added, but that will evaporate. Simmer the sauce on a very low fire, uncovered, for two hours. Remove the layer of fat that floats on top. I use kitchen paper to do this, it absorbs the top layer with fat, without disturbing the liquid underneath. Strain the sauce and pour in a clean pan. Add tomato purée now, when it is used. 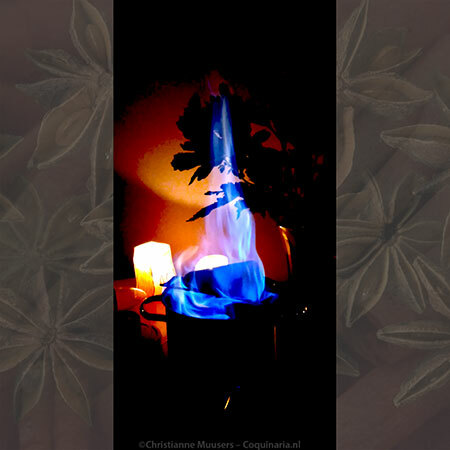 Continue to heat the sauce uncovered on a low fire until there is about 8 to 10 decilitres left. If the sauce is not used immediately, pour it in a bowl and stir it often until it has completely cooled. Otherwise, the sauce will form lumps and a thick skin on top. Pour the sauce in a container with a lid, and keep in the refrigerator until further use. This is a basic sauce to be used in other preparations. It is only then that the sauce will be brought to taste and salt will be added. Maybe Bocuse’s version is still too much work for some. In a Dutch cookbook from the nineteen-sixties by Mia Snelder, the Prisma Kookboek, is an even simpler version. Melt 50 gram lard or butter and let it turn brown. Use it to fry chopped lard, carrot, onion and parsley. Then add 50 gram flour and heat gently until the sauce has acquired ‘the colour of uncooked brown beans’. Keep stirring the sauce to prevent burning. Then gradually add liquid. That liquid can be flavourful stock, gravy, or the cooking liquid of brown beans. Cover the pan and simmer the sauce for about fifteen minutes. Strain the sauce and finish it with for example Worcestershire sauce, soy sauce, burnt sugar or simply ‘brown from the pan’. Snelder speceifically mentions that milk or cream must not be used to finish the sauce. And even Snelders has a more simple way to prepare the sauce espagnole: use flour, browned in the oven, instead of roux. Ten years later Bocuse will mention that too as a possibility. The butter is added later, as much “as is necessary according to taste, cost, or diet”. Espagnole is the basis for other sauces like sauce bordelaise, sauce chasseur and sauce madère. I started researching the sauce because of the mention of just a spoonful of it in the stuffing of the Russian chicken pies of Carême. But since I had some leftover sauce, I decided to prepare such a derived sauce, the sauce piquante. I followed Bocuse’s recipe. 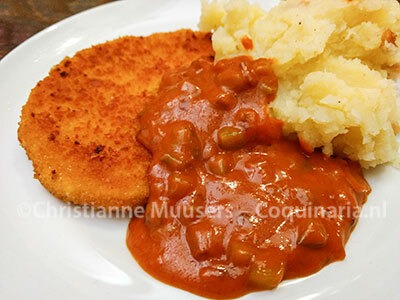 The sauce piquante can be seen on the photo above, with mashed potatoes and a schnitzel. Once the sauce espagnole is prepared, the rest is very simple: fry 1 onion and 2 shallots, all chopped, in some butter. Add 3 tablespoons wine vinegar, reduce to 1 tablespoon. Add 3 decilitres demi-glace or sauce espagnole to the pan and simmer fifteen minutes. Remove the pan from the heat and beat in 4 tablespoons of cold butter in small lumps, and finish with 2 chopped gherkins and some black pepper. By the way, demi-glace is actually sauce espagnole that has been reduced some more, with a glass madeira wine added. This is the French version of a cured ham, like Italian Parma ham, Spanish Serrano ham and Iberico ham, German Schwartzwalder Schinken, and Belgian Ardenner ham. Bayonne ham is produced in the South-West of France. Paul Bocuse, La cuisine du marché. Flammarion, Paris, 1976 (Link is tothe edition of 2016). Page with books by Bocuse on Amazon.com. Antonin Carême, Armand Plumerey, L’art de la cuisine française aux XIXe siècle, Tome V 1844. (Replica Elibron Classics 2005, inclusing a print mistake on the front cover). Mia Snelder, Prisma kookboek. Sleutel tot de kookkunst. (Prisma Cookbook. Key to the art of cooking) Uitg. Het Spectrum N.V., Utrecht, 1964 (4th edition). De sauce espagnol or ‘spanish sauce’is one of the mother sauces of classic French cuisine. It is used as a base to prepare all kinds of ‘lesser’ sauces. It takes some time to prepare this sauce, even when following the modernized version of Bocuse.